Gold nugget at American Museum of Natural History; photo by Eden, Janine and Jim on Flickr (use permitted with attribution). 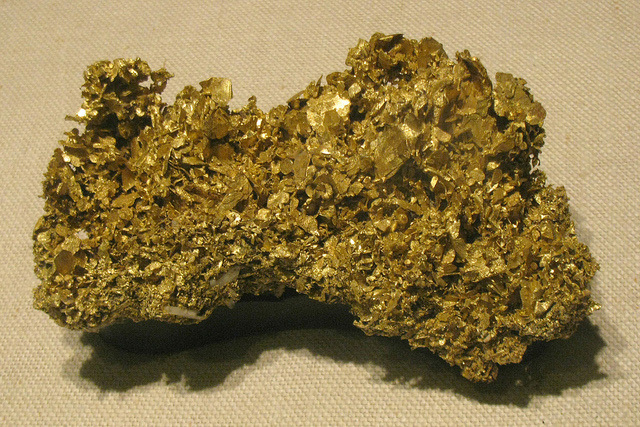 North Carolina designated gold as the official state mineral in 2011. North Carolina was the site of America’s first gold rush, beginning in 1799 when 12-year-old Conrad Reed found a 17-pound gold nugget while fishing in a Cabarrus County Creek. For the first half of the 19th century, gold mining was North Carolina’s second most important industry after agriculture.